Draft: 2005, Colorado Rockies, 1st rd. 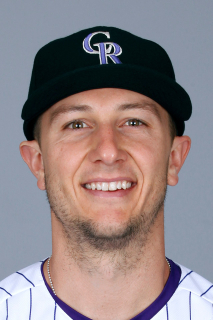 Full name is Troy Trevor Tulowitzki…married his high school sweetheart, Danyll, in 2009 and the couple has one son, Taz…Troy's father, Ken, was his best man at the wedding ceremony...Majored in kinesiology at Long Beach State…was a three-year starter at the school, where he was a two-time All-American and three-time All-Big West selection…prior to being drafted, was ranked as the No. 4 overall prospect by Baseball America, in addition to being tabbed as having best arm strength among all collegiate position players…batted .310 with 20HR and 48 multi-hit contests in 155 career games for the Dirtbags, becoming just the sixth player in program history to clear the 20-homer plateau…helped lead Long Beach State to consecutive NCAA Super Regionals in 2004-05, earning First Team All-Big West in each of those two campaigns…was named Most Outstanding Player at 2004 Palo Alto Regional after hitting three key home runs against Stanford…batted a team-best .349 with 8HR and 29RBI in 39 games in 2005…missed 20 games during his final collegiate season after surgery on the hamate bone in his left hand…was named a First-Team All-Big West selection and a Third-Team All-American by Collegiate Baseball after the 2005 season…hit .317 with team-high 7HR in 2004, posting a .491 slugging pct.…in his first season in 2003, led the team with 44RBI...During summer of 2004, was starting shortstop for a Team USA that won the gold medal as part of the world championships in Taiwan...Graduated from Fremont High School in Sunnyvale, Calif.…was named Fremont High "Athlete of the Year" in 2002…earned four varsity letters in baseball and two in basketball…was twice named Second-Team AllState in baseball and was a three-time team MVP…batted .536 as a junior and .519 as a senior…went 15-1 on the mound during his junior year...Was a league MVP in basketball, where he was Second-Team All-State and team MVP…averaged 22.6 points in basketball his senior year. Missed the entire season on the 60-day disabled list after undergoing surgery on 4/2 for bilateral bone heel spurs…the surgery was performed by Dr. Tom Clanton in Vail, Col...Was unconditionally released by Toronto on 12/14. Of his 60 hits, 40 came in multi-hit efforts ... Hit seven home runs, his lowest total since his first MLB season (1 HR in 25G)…Five of his seven homers were solo shots… Five of his seven homers were at Rogers Centre ... On April 21 at LAA, left the game in the 8th inning with right hamstring tightness after sliding into 3rd base while advancing on a wild pitch…Landed on the 10-day DL on the next day and missed 31 games ... Appeared in 5G of rehab at Dunedin, going 4-for-14 (.286) with a home run...Was activated off the DL on May 26 vs. TEXand went 1-for-2 with two walks and a run ... Hit his 4th career grand slam on May 29 vs. CIN (last: Sept. 11, 2016 vs. BOS), all of which have come in home games... Marked his 20th career 4+ RBI game (2nd of the season and 6th as a Blue Jay)...It was his first HR since April 7 at TB (his other 4-RBI effort) and his first extra-base hit since a double on April 14 vs. BAL ... Had a streak of 37 straight PA without striking out snapped in his last AB of the game on May 30 vs. CIN ... On June 24 at KC, hit his 1st homer of the season off of a left-handed pitcher (J. Vargas), his first since Aug. 10, 2016 vs. TB (B. Snell) ... Ended a streak of 22 straight AB without a hit with RISP on July 6 vs. HOU, the 2nd longest drought of his career (27-AB streak in 2009) ... Hit five home runs over a 14-game span from June 24-July 8 (had hit just 2-HR in the previous 39G)…Hit a HR in back-toback games on July 7-8, his first time to do so since July 2-3, 2016 ... Collected four hits on July 18 at BOS for his 17th career 4+ hit game and his 2nd since joining the Jays (also Aug. 16, 2016 at NYY - 4H) ... Was placed on the DL on July 29 for the remainder of the season with a sprained right ankle...The 66 games played were his fewest since 2012 (47G). the A's as well... Hit his first home run of the season on Opening Day, April 3 at TB…Has hit HR in three of his last five Opening Day starts…Is the 2nd TOR-SS to homer on Opening Day (Alex Gonzalez in 1996 & 1997)...It represented his 4th career HR on Opening Day (2009, 2012, 2013)…His four Opening Day home runs ties Dustin Pedroia for the most in the Majors since 2009. Was acquired by the Toronto Blue Jays on July 28 along with RHP LaTroy Hawkins in exchange for SS Jose Reyes, RHP Jeff Hoffman, RHP Miguel Castro & RHP Jesus Tinoco. In 41 games with TOR had five defensive runs saved…Prior to his acquisition, TOR-SS had -7 defensive runs saved…TOR owned a record of 32-9 when he was in the starting lineup. Hit .239 (39-163) after joining the Blue Jays with 13 of those hits going for extra bases (8-2B, 5-HR)...Batted leadoff in 26 contests. Made his Blue Jays debut on July 29 vs. PHI, hitting a HR in his 2nd at-bat, snapping a career-high 0-for-21 skid…His first three hits at Rogers Centre, including while with COL, were all HR…Would later hit 2-2B in the contest finishing 3-for-5 with 3RBI. Was diagnosed with a cracked scapula and upper back muscles bruising after a collision with Kevin Pillar September 12 at NYY-1…Returned October 2 at TB after missing 19 games due to the injury. Had his streak of reaching base safely snapped at 41 consecutive games on July 21…Over the course of the streak, batted .365 (57-for- 156) with 4-2B, 10-HR, 34-RBI, and 18-BB. In games in which he played at shortstop, his on-base streak reached 44 games, 3rd longest on-base streak for a shortstop since 1993 (longest: Orlando Cabrera, 63 games, April 25-July 6, 2006). Had his career-high, 21-GM hitting streak snapped July 11...Tied for the 5th-longest hitting streak in Rockies history...Batted .354 (29-for-82) with 2-2B, 2-HR, and 13-RBI over those 21 contests. Led the NL in AVG in June & finished 3rd in ML, hitting .381 (37-97). June 25 vs. ARI hit the game-tying home run as a pinch-hitter in the 8th inning… Was the first pinch-hit home run of his career. Recorded a season-high five RBI vs. LAD on June 3, 6th time in his career he has driven in at least five runs. Posted his 11th two-home run game of his career at PHI on May 29, first since July 9, 2014…The four hits were his most since June 5, 2013. Played in his 1,000th Major League game in the second game of the May 23 doubleheader...Became one of five Rockies all-time to play in 1,000 games. April 25 vs. SF hit his 100th career HR at Coors Field. Was the first Rockies player to open season doubling in first five games. Had three hits, including career-high tying two doubles and three runs, Opening Day at Milwaukee. Became the first Blue Jays shortstop to hit a home run in the postseason in team history in game three of the ALDS…That 3R-HR was just the third of its kind in the playoffs in club history…The other two were hit by Candy Maldonado (1992 ALCS GM 6) and Joe Carter (1993 walkoff to win World Series, GM 6)…Would later hit another 3R-HR in game four of the ALCS becoming the first player in franchise history to hit multiple 3R-HR in the same postseason. Recorded a postseason career-high four RBI in game three of the division series vs. TEX, becoming the first Toronto player to collect that many RBI in a single playoff game since Joe Carter in game six of the 1993 World Series…Marked his first career multi-RBI game in the playoffs. Drove in 11 runs in the playoffs, T-3rd most among all hitters…His 11 RBI rank T-2nd all-time in Blue Jays postseason history (Molitor-13, 1993). Along with Ryan Goins and Josh Donaldson homered in game three of the ALCS, marking just the 2nd time in postseason history that a second baseman, shortstop and third baseman on the same team have each homered in the same game… The last time that had happened was in game one of the 1995 ALDS between Boston & Cleveland, when Luis Alicea (second base), John Valentin (shortstop) and Tim Naehring (third base) accomplished the feat for the Red Sox. His seven RBI vs. KC represents the most runs driven in by a single Blue Jays player in an ALCS in club history…Those RBI were the most driven in in a LCS since Nelson Cruz had 13 in 2011. Earned his fourth All-Star selection and had arguably his best first-half of a season in his career...was also the National League's Captain for the Home Run Derby, participating for the first time...was the NL's leading vote-getter, the first time for a Rockies player...was his third All-Star start...Suffered an injured hip in the second game after the All-Star break on July 19 at Pittsburgh and would miss the remainder of the season while requiring surgery to repair his left hip...Set career-high marks for pre All-Star production in runs (71), hits (107), doubles (18, T1st in 2011), home runs (21), walks (48), batting average (.345), on-base percentage (.435), slugging percentage (.613) and OPS (1.048)...At the All-Star break, was tied for the NL lead in home runs with Giancarlo Stanton and led the NL in batting average, OBP, SLG and OPS...Despite missing nearly the entire post-All-Star schedule, marked the sixth time in his career to post 20-plus home runs...his six seasons of at least 20-plus home runs are tied with Nomar Garciaparra and Vern Stephens for fifth-most by a shortstop in MLB history...Collected his 1,000th career hit on May 3 vs. New York-NL...is one of five players with 1,000-plus hits as a Rockie...his 1,068 hits with the Rockies is fifth-most...Voted NL Player of the Month for April after finishing the opening month of the season with a MLB leading .477 OBP and .727 SLG...his .364 batting average trailed only teammate and fellow 2014 All-Star Charlie Balckmon for the MLB lead...ranked among the NL leaders with 24 runs (1st), 64 total bases (2nd), 22 RBI (T3rd), 7 home runs (T4th), nine doubles (T5th) and 21 walks (T2nd)...was his second monthly award, as he previously won the award for his historic Sept. in 2010...Named NL Player of the Week for the week of April 28-May 4...hit .619 (13-for-21) with three doubles, two home runs, eight RBI, nine runs, 1.740 OPS (.692 OBP, 1.048 SLG) for the week. Was the National League's 9th-leading hitter, batting .312 (139-for-446) on the season, a mark bested only by his .315 average in 2010...was the third time in his career to hit at least .300 (also .302 in 2011)... Notched his fourth career 25-plus home runs season with his 25 homers in 2013...following his highly productive 2013 season, Tulowitzki is the Rockies all-time leader for a shortstop in nearly every offensive category, including: runs (543), hits (961), doubles (187), home runs (155), RBI (552), extra-base hits (365), stolen bases (54), batting average (.295), slugging percentage (.509) and OPS (.877)... Finished 2nd in the NL with a .540 slugging percentage (Paul Goldschmidt .551)...his .931 OPS was also 2nd in the NL to Goldschmidt (.952)...the .931 OPS marks his 4th season with a .900-plus OPS (2009-.930, 2010-.949, 2011-.916)... He owns a career .510 slugging percentage as a shortstop...his .510 slugging percentage is the 3rd-highest since 1974 for a Major League shortstop with at least 3500 plate appearances (Garciaparra .541 SLG as a shortstop, Hanley Ramirez .513)... Led the NL with a .986 fielding percentage...his .985 fielding percentage since his rookie season of 2007 is the highest among Major League shortstops... Had multi-home run games on 5/29 vs. HOU and 6/5 at CIN...on 6/5 at CIN he went 5-for-5 with 2 home runs, 3 RBI and 3 runs...in that same game, teammate Carlos Gonzalez also had 3 home runs...according to Elias, it marked the first time in MLB history for one player to go 5-for-5 with at least 2 home runs also have a teammate hit 3 home runs... Was named to his third career All-Star team, making the club as a starter as voted by the fans for the first time in his career...hit .332 (77-for-232) with 16 doubles, 16 home runs and 52 RBI in 64 pre All-Star games...his .332 pre ASG average was a career-high while his 16 HR and 52 RBI were the 2nd-most of his career (17 HR, 57 RBI in 2011)... Tulowitzki proved a tough out against both left-handed pitchers (.318 AVG, .906 OPS) and right-handers (.310 AVG, .938 OPS) in 2013...Tulowitzki also slugged .498 with an .850 OPS on the road in 2013... Was at his best vs. division foes, as he batted .330 (66-for-200) with 15 doubles, 7 home runs, 40 RBI and a .918 OPS against the four other NL West teams. Had an injury plagued 2012 season, as he played in by far his fewest games (47) in his six full MLB seasons. Suffered a strained left groin on 5/30 vs. HOU and would never return to the Majors...was later diagnosed withHockey/Baseball Pitcher Syndrome, which is a type of athletic pubalgia or core injury to his left groin...had surgery on 6/21in Philadelphia, performed by Dr. William Meyers. Played in three rehab games for Triple-A Colorado Springs, batting .300 (3-for-10) with 1 double, 1 home run and 2RBI...played in six rehab games for Double-A Tulsa, batting .353 (6-for-17) with 1 double, 2 home runs and 4 RBI. Hit .287 (52-for-181) with 8 doubles, 2 triples, 8 home runs, 27 RBI and an .846 OPS (.360 OBP, .486 SLG) in 47 gamesprior to the injury...was hitting far better vs. right-handers (.333) than left-handers (.173)...is a career .308 hitter vs. LHPand a .286 hitter vs. RHP. Hit safely in each of his final nine games of the season (5/21-30) at .389 (14-for-36) with 4 doubles, 4 home runs, 11RBI and 10 runs. Ranks in the Rockies top-10 in franchise history in: hits (822, 7th), runs (471, 7th), doubles (160, 8th), home runs (130,6th) and RBI (470, 8th). Despite missing the majority of the season, Tulowitzki still leads all MLB shortstops in home runs (129) since his rookie season of 2007. Had a second consecutive highly productive season in 2010 that resulted in his first career NationalLeague All-Star selection...Earned his first career Rawlings Gold Glove Award® after leading all NL shortstops in fielding percentage(.984), double plays (103), total chances per 9.0 innings (5.15) and putouts per 9.0 innings (1.78)...Tulowitzki is the first NL shortstop to lead the NL in both slugging percentage and fielding percentagesince Jay Bell with Pittsburgh in 1993...Posted a batting line of .315 (148-for-470) with 32 doubles, three triples, 27 home runs, 95 RBI, 89 runsscored, a .381 on-base percentage and a .568 slugging percentage...his .949 OPS in 2010 is a new carrerhigh...set career highs in average, on-base and slugging as well...Finished in the top-5 of the NL in average (4th), slugging (4th), OPS (4th) and at bats per RBI (4.95, 2nd)...Finished the season by posting one of the most productive September's in Major League history...inSeptember he hit .322 (37-for-115) with six doubles, two triples, 15 home runs, 40 RBI, 30 runs scoredand an .800 slugging percentage...the only other Major League player to equal or exceed Tulowitzki'stotals in both home runs and RBI during September in any season was Babe Ruth, who did it in 1927(17 HR, 43 RBI), (Elias)...Tulowitzki is also just the sixth player to have at least 40 RBI in a single monthin the Majors since 1954...Tulowitzki's 15 home runs and 40 RBI in September set new franchise records for most home runs andRBI in a single month...the previous records were 12 home runs (5 players) and 39 RBI (Dante Bichettein June 1996)...Led all Major League shortstops in average, on-base percentage, slugging, OPS, home runs and RBI...Led the club with both 16 game-winning RBI and 28 go-ahead RBI...finished sixth in the NL in game-winningRBI and fifth in go-ahead RBI...Batted .323 (76-for-235) with 18 home runs and 61 RBI after the break...he has 116 RBI in 129 post All-Star break games since 2009, which is second in the NL behind only the 117 RBI Ryan Howard has...Tulowitzki has 332 RBI since 2007, which is the most RBI among Major League shortstops to play strictlyshortstop since 2007. Finished his third Major League seasonwith a .297 batting avg. (161-for-543) with 32 homeruns and 92 RBI...became the first shortstop in clubhistory to lead the club in the following categories:homers, RBI, total bases (300) and runs(101)...posted the 2nd-best fielding pct. (.986) by ashortstop in club history, just short of his own record(.987 in 2007)...ranked 2nd among NL shortstops infielding pct., trailing only Jimmy Rollins (.990)...ledall MLB shortstops in HR's...hit .344 in the secondhalf (led Rox, 4th in NL)...had 55 RBI after the All-Star break, 16 of which were go-ahead (led Rox inboth categories after the break)...went 35-for-100with runners in scoring position from 6/7 through theend of the season, after starting slowly in that category(3-for-41 w/RISP in first 39 games through 6/6)...recorded career-high 20 stolen bases and becamethe 2nd Rox shortstop with double-digit HR's and SB in a season (also: Neifi Perez, 1999); recorded justthe 6th 20-20 (HR-SB) season by a Rox player, the first infielder to do so...had career-best 9 triples, whichwere the most by any player in the Majors who hit at least 30 home runs...ranked 2nd on the club in stealsbut led the team in caught stealing (11)...led the team with 19 infield hits and also had 4 bunt singles...drewcareer-best 73 walks and struck out fewer times (112) than in his rookie season (130 K's in 2007)...had 9sacrifice flies, more than doubling his career total entering 2009 (4 sac flies from 2006-08)...finished theseason hitting cleanup, going 67-for-195 (.344) with 12 HR's and 41 RBI from that spot; the club went 31-19 when he started in the No. 4 slot...hit 27 of his HR's from 6/8 through the end of the season; averaged13.7 at-bats per HR in that span (34.4 AB/HR prior to that)...of his 32 HR's, 21 were solo shots, 13 werego-ahead and 10 broke up a 0-0 tie game...led Rox with 4 Interleague HR's...grounded into 20 doubleplays,more than any other player on the Rox (11th in NL)...on the Opening Day roster for the 3rd time;became the only player in Colorado history to start on Opening Day three times before his 25th birthday...hitHR's in each of his first 2 games of the season; hit one HR off each of the D-Back's All-Star starters BrandonWebb and Dan Haren...was a nominee for NL Player of the Week, as he posted an .842 SLG, 3 HR, 5 RBIin the opening week...started the first 11 games at SS, only Rox player to start first 11 games at same position...hit .346 on 5/6-13 homestand (two 1st-inning HR's in series vs. FLA)...left 5/10 with left quadstrain...HBP in elbow 5/13; left game with contusion...5/23 had first hit w/RISP since 4/11 (snapped 0-for-27 streak); went 0-for-27 with runners in scoring position from 4/12-5/21...had just 4 RBI from 5/19-31 (11games), and all 4 RBI were on sacrifice flies...first 7 multi-hit games in '09 were in a span of 14 games,4/29-5/15...left 6/2 game w/left hand contusion (x-rays - negative)...no starts 6/3-6...a hitless game on 6/14vs. SEA stood between him and 14-game hit streak (hit safely in 15 of 16 games, 6/7-23 at .431; 22-for-51)...finished with 15 RBI, 14 walks, 7 SB, .398 OBP, .610 SLG in June; 7 HR's in June (T-6th in NL)...firstcareer multi-HR (2) game 6/23 at LAA...had consecutive games with an error (7/1-3) for first time since 8/3-4, 2008...hit 5th cycle in club history 8/10 vs. CHC - 6th in MLB in '09, 287th all-time...career highs in hits(5-for-5), RBI (7) 8/10 vs. CHC; first SS in MLB history to go 5-for-5 (or better) and have at least 7 RBI ina game...3rd career walk-off hit 8/25 vs. LAD; walkoff single in 10th inning...hit career-best 25th HR 9/12at SD...did not play 9/8-10 (lower back strain)...returned to lineup 9/11 and led club with .394 AVG (13-for-33), 5 HR's, 6 RBI on 9-game road trip (9/11-20); hit HR's in career-best 4 straight games, 9/15-19 tobecome first player to homer as a shortstop in 4 consecutive games since Miguel Tejada (2005 Orioles)and first NL shortstop to do so since Rich Aurilia (2001 Giants)...hit safely in 16 of final 19 games (.411, 30-for-73), 8 HR's in that span...named National League Player of the Week (week ending Sept. 20); in 6games, Tulowitzki tied for the Major League-lead with 4 HR's and 8 runs scored...he tied for 2nd in MLBwith 21 total bases and had a .913 slugging pct...143 of his 151 games in the field were error-free. In a season interrupted by two stints on the disabled list, Tulowitzki hit .263 (99-for-77) with 24 doubles, 8 HR and 46 RBI in 101 games...led all NL shortstops after the All-Star break with a .327 avg. (74- for-226); also hit 5 HR and recorded 30 RBI in 62 games in the second half...struggled at the outset of the season, hitting .152 (16-105) with 1 HR and 11 RBI in his first 26 games before going the disabled list with a left quadriceps tendon tear (sustained while fielding a groundball in the 1st inning 4/29 at SF)...started 25 of the club's first 27 games at SS and his 96 assists led all MLB shortstops when the injury occurred...despite his struggles, he delivered 2 of the team's 3 last-at bat wins in April; on 4/17 at SD, he drove in the winning run in the 22nd inning of a 2-1 Rockies win, and on 4/24 vs. the CHI, he drove in the game-deciding run in the 8th-inning on an RBI-fielder 's choice groundout; finished the season with 3 game- winning plays in the 8th inning or later...reinstated from DL on 6/20 after missing 46 games (club went 20- 26 in that span)...played just 13 games before landing on the DL again, this time with a laceration on his right hand; sustained when his bat shattered after pounding it into the ground after being removed from game 7/4 vs. FLA...missed 13 games with that injury...returned to the lineup 7/21 vs. LAD and set career high with 5 hits (5-for-5) in that game...hit .245 (26-106) with 4 HR, 37 RBI w/RISP position but went 8-for- 22 (.364) in that situation over his final 17 games of the season...batted .280 (56-200) on the road and hit safely in 25 of his final 33 road games at .372 (45-for-121), 4 HR...most frequently hit No. 2 in the lineup with most of the those AB's coming early in the season; hit .222 (32-144), 1 HR from that spot...logged a .306 avg. (30-98), 3 HR from the No. 7 spot in the lineup...committed just one error in his final 34 games and made only 2 errors in his last 48 contests...posted a .984 fielding pct. (3rd all-time by Rockie SS) (509 total chances, 311 assists)...Rox went 25-15 in games when he scored at least 1 run...became only the second Rockie to make two Opening Day starts for the club under the age of 24 (2B Roberto Mejia was 21 T U L O W I T Z K I and 22 in both of his starts from 1994-95)...reached base 4 times on Opening Day at STL, going 3-for-4 with a double and a walk...scored club's first run of '08 on a fielder 's choice/error off the bat of Matt Holliday...went hitless in next 20 at-bats after going 3-for-4 in opener...snapped 0-for-20 streak at the plate 4/16 with a 9th inn. 2-run double, his first RBI of the season and first hit w/RISP (1-for-14)...the night after driving in game-winning run on 4/17 at SD (RBI-double scoring Taveras in 22nd inning), he gave Rockies a 2-0 lead in first inning with a 2-RBI double on 4/18 at HOU...hit first HR 4/23 vs. CHI, a 3-run shot off Jon Lieber in the 6th inn., giving Rox 5-3 lead... suffered strained left quad 4/29 at SF after throwing off-balance to first base then aggravating it 2 batters later while charging Aaron Rowand's groundball in the first inning; in the lineup only because Jeff Baker broke a blood vessel in his right middle finger during BP...returned from DL and went 0-for-4 in first game back from DL 6/20 vs. NYM; made him hitless in his last 16 MLB AB's...hit 2-run HR 6/29 at DET; marked first RBI since 4/25 at Los Angeles (snapped 12-game streak with no RBI, 44 AB)...on DL 7/5 with right hand laceration...reinstated from DL 7/21 vs. LAD after hitting .333 (5- for-21) with 2 HR, 3 RBI in 5 games during Double-A Tulsa rehab assignment from 7/16-20; became 2nd Rockie to have 5 hits in a game in '08 in his first game back from that DL/rehab stint...went 12-for-23 imme- diately after coming off DL...batting avg. reached .222 after going 2-for-3 on 7/29 at PIT (highest since .250 on 4/3)...finished July with a .418 avg. (23-for-55), 1 HR, 7 RBI...HR on 8/15 at WAS marked his first extra- base hit in 14 games (48 AB)...solo HR 8/20 at LAD was 2nd on road trip and gave him 5 RBI in his last 5 games after having just one RBI in previous 10 games...HR 9/2 vs. SF was first HR at home since 7/2 vs. SD, just 3rd of season at Coors...delivered team's 7th walk-off win on 9/14 vs. LAD, giving the Rox a 1-0 win vs. the Dodgers in 10 innings (15th last-at bat win for Rox)...his grand slam 9/15 vs. SD was the 2nd of his career and the 3rd for the Rockies in '08...finished strong, hitting .424 (14-33) in his last 8 games of the season; had 4 multi-hit games in that stretch including 4-for-5 effort 9/23 at SF. Beyond producing one of the best rookie seasonsin franchise history, Tulowitzki became a key member of thisyear's team with clutch hits and sparkling defensiveplays...batted .291 with 24 home runs and 99 RBI in 155games for Colorado this season...his 99 RBI is the most in aseason by a shortstop since Miguel Tejada had 150 RBI forBaltimore in 2004...the last NL shortstop with more RBI thanTulowitzki in a campaign was St. Louis' Edgar Renteria whenhe had 100 RBI in 2003...just one Rockie had more homeruns than Tulowitzki (15) after the All-Star break (Holliday,21)...his 24 home runs ranked as third-most among all MajorLeague rookies this season, while his .291 average was thethird-highest qualifying figure for all big league rookies...he ledall qualifying Major League shortstops with a .987 fielding pct. (11 e/834 tc), slightly better than Omar Vizquel (.986, 9 e/651tc)...also led all big league shortstops in total chances (834),assists (561), putouts (262), and double plays (114)...started155 of the club's 163 games at shortstop, including each ofthe final 61 contests...won the 2007 Fielding Bible Award forBest-Fielding shortstop in the Majors...had 21 go-ahead RBI,T3rd-most among Rockies behind only Matt Holliday (30) andBrad Hawpe (23)...Todd Helton also had 21 go-ahead RBI onthe club...hit .333 (46-for-138) vs. lefties and .278 (131-for-471) against right-handed pitchers...hit .279 (48-for-172) withrunners in scoring position, including .478 (11-for-23) with thebases loaded...had a .359 (56-for-156) average with nine homeruns and 29 RBI in 38 games against NL Centralteams...went 10-for-25 (.400) with three homers and six RBI in sixgames vs. Milwaukee...22 of his 24 home runs came over theseason's final four months...hit .538 (7-for-13) in four games atCitizens Bank Park...hit eight of his 24 home runs on the firstpitch of an at-bat, as he batted .400 (44-for-110) when puttingthe first pitch in play...had a .297 (86-for-290) average whenhitting in the second spot in the batting order...31 of his 99 RBI(31.3%) came in the seventh inning or later...hit .241 (32-for-133)over his first 34 games through May 13...from May 14-July17, had a .317 (64-for-202) mark with eight home runs, eight doubles,and 26 RBI over 53 games to raise season mark from.241 to .287...had another mini-slump July 18-Aug. 6, hitting.186 (11-for-59) to drop from .287 to .272...would hit .326 (70-for-215) over the final 52 games beginning Aug. 7 to finish at.291...at 22 years, 174 days old on April 2, he was the 2ndyoungestOpening Day starter in Rockies history...only second baseman Roberto Mejia was younger forhis starts in both 1994 and 1995...joined Clint Barmes (2005) as the only rookies ever to start an openerat shortstop for Colorado...hit a game-tying, two-out RBI double off the glove of a diving Eric Byrnes in the11th inning on April 3 vs. Arizona, then scored the winning run on Chris Iannetta's one-hopper to third basethat got by Alberto Callaspo, a play on which he was charged with an error...sat for three consecutive gamesApril 21-23, but would start 139 of club's final 143 games beginning April 24...in that April 24 game at NewYork-NL, hit an RBI triple off Billy Wagner in the 10th inning to give Colorado a brief 1-0 lead...Tulowitzki'sfirst career triple was his first extra base hit since April 3 vs. Arizona, the second game of the season...hithis first two homers of the season in consecutive games April 27-28 vs. Atlanta, and would not hit anotherlong ball until June 7...that July 27 long ball began a 10-game hit streak through May 7...turned an unassistedtriple play on April 29 vs. Atlanta...did not go more than two straight games in May without a hit, batting.303 (33-for-109) for the month...hit safely in seven straight at .429 (12-for-28) to end the month...went 3-for-5 with a homer, double, and three RBI on June 7 vs. Houston, including a walk-off single that capped theRockies' three-run ninth inning in come-from-behind win...homered in three straight June 21-23...on Rockies' ill-fated1-9 road trip in late June, hit four home runs...three of those four home runs gave the Rockies the lead in the ninth inning or later, all three of which resulted in walk-off defeats for Colorado on blown saves by Brian Fuentes...hittwo-run homer in 10th inning on June 22 at Toronto to give Rox 8-6 lead, only to see Jays score three times inbottom of 10th...hit a three-run homer on June 25 at Chicago-NL to cap Rockies' six-run ninth inning and give cluba 9-8 lead, only for Cubs to score twice in bottom of ninth after Kazuo Matsui's first error of the year...did itagain June 28 at Houston, solo homer in the 11th to give Rox a 5-4 lead, only to see Carlos Lee hit a walkoffgrand slam in the bottom of that frame...missed consecutive games July 24-25 vs. San Diego with astomach ailment...had his best month in August, batting .333 (40-for-120) with six homers, eight doubles, 25RBI, and 18 runs scored in 29 games...was named the NL Rookie of the Month for August, leading all NLrookies in RBI and hits (40)...posted a career-high 12-game hit streak Aug. 16-27...homer on Sept. 10 atPhiladelphia was his 20th of the season, passing Ernie Banks' 1954 total for most ever by an NL shortstop...on Sept. 11 at Philadelphia, appeared on JumboTron Kiss Cam and attempted to lay one on SethSmith, who backed away...hit a two-run homer in the sixth inning on Sept. 25 at Los Angeles, giving club a 6-5 lead in eventual 9-7 win...hit .367 (11-for-30) with runners in scoring position in September...hit his firstcareer grand slam on Sept. 29 vs. Arizona off Dustin Nippert...batted .295 (26-for-88) with five home runs and19 RBI over his final 21 games...was a home run shy of hitting for the cycle in the tiebreaker game on Oct.1 vs. San Diego...tied his career high with four hits as he went 4-for-7 with three runs scored, two doubles, one triple,and one RBI...scored the game-tying run in the 13th inning...prior to the season was named the 2007 AbbyGreer Award winner during Spring Training. Spent most of the year with Double-A Tulsa, but made his major league debut for Colorado inlate August...it was just his second professional season, as he had never played above the Single-A levelprior to '06...in fact, had played just 126 minor league games before being called to the big leagues...batted.240 with one home run and six RBI in 25 games for Colorado...at the time of his major league debut,he was 21 years, 324 days old, making him the third-youngest position player in franchise history and fifth youngestoverall...only Juan Uribe (21.261) and Roberto Mejia (21.092) had been younger when makingtheir Rockies debut...Tulowitzki reached the major leagues in the shortest span of time between draft dayand debut of any position player in Rockies history (one year, 83 days)...among Rox draft picks, only righthandedpitcher Craig House (one year, 65 days) made it to the majors in a shorter span of time...hebecame just the sixth player from the 2005 draft to appear in the majors, and just the second position player(also Washington's Ryan Zimmerman)...Tulowitzki was the sixth player to be the Rockies' first overall amateurdraft pick and appear in the big leagues for the club...a pair of other Rox first overall selections playedin the majors for other teams, but not Colorado...he joined Todd Helton as the only such position playersto appear for the Rockies...he was selected to the U.S. roster of this year's Futures Game on July 9 inPittsburgh, walking in his only plate appearance...had his contract purchased from Tulsa after Rockiesgame on Aug. 29 vs. New York-NL...started 23 of the club's final 31 games at shortstop...team went 11-12in his starts...went 0-for-1 as a pinch-hitter...went 6-for-14 (.429) with RISP over his final nine games...went1-for-13 over his first four games in the big leagues, but, beginning with a four-hit game on Sept. 3, hit .265 (22-for-83) over his final 21 contests...made his major league debut as starting shortstop on Aug. 30 vs. NewYork-NL, going 0-for-4 with three strikeouts...recorded first major league hit on Aug. 31 vs. New York-NL withan infield single off Oliver Perez in the third inning...posted first big league RBI on fielder's choice Sept. 1 atLos Angeles...went 4-for-4 with a double and walk on Sept. 3 at Los Angeles, his first career multi-hit gameand only career game with more than two hits...went 2-for-4 next night, Sept. 4 at San Diego, with his firstand only major league home run, a solo shot to center field in the fourth inning at PETCO Park off WoodyWilliams...compiled a career-high six-game hit streak, Sept. 16-23 at .385 (10-for-26)...was just 2-for-22over his final five games after that hit streak to finish at .240...started seven straight from Sept. 3-9, but, after that,never started more than four consecutive games the rest of the way...spent the rest of the year with Double-A Tulsa, batting .291 with 13 home runs and 61 RBI over 104 games...despite playing in just 104 of theplayoff club's 139 games, still ranked among team leaders in doubles (3rd, 34), runs (T3rd, 75), home runs(4th), walks (T4th, 46), and RBI (5th, 61)...was part of a Drillers club that won the first half title in the NorthDivision, but was called up to the big league club just prior to the Texas League playoffs...hit leadoff duringhis time with Drillers...hit .396 (36-for-91) vs. lefties and .262 (87-for-332) against right-handers...homeredin each game of three-game series May 22-24 vs. San Antonio...went 3-for-6 with two homers and six RBI onJuly 11 at Frisco...that contest was part of a 15-game hit streak July 7-25...the hit streak was part of a stretch in which he reached base safely in 24 consecutive games, July 7-Aug. 13...posted season-high fourhits May 24 vs. San Antonio...was hit by pitch on left hand July 29 at Springfield, and spent a short stint onthe disabled list...hit safely in first 6 games after his return on Aug. 6...was starting shortstop for NorthDivision squad in Texas League All-Star Game on June 20 at Little Rock's Ray Winder Field...went 1-for-4in the game...named third-best prospect in the Texas League following the season...was selected to play forGrand Canyon Rafters in Arizona Fall League following the season, batting .329 (26-for-79) with one homerand 10 RBI...was named the AFL's No. 1 prospect by Baseball America. The Rockies' first selection in last year's June draft, Tulowitzki (TWO-lo-witz-kee) saw his first professional action with High-A Modesto, batting .266 with four home runs and 14 RBI in 22 games...the right-handed batter was limited by a strained left quad muscle that was suffered on Aug. 2, but returned near season's end and appeared in all five Modesto playoff games...also participated in Rockies instructional league...rated as the organization's No. 2 prospect following the season by Baseball America...tabbed as being best defensive infielder and having best infield arm among Rockies prospects by the same publication...prior to the draft, was ranked as fourth-best overall prospect by Baseball America, in addition to being labeled as having best arm strength among all collegiate position players...becomes just the 12th player in franchise history to be a part of major league spring camp the year after being drafted, second in the last five springs...of those 12, is just third non-pitcher/catcher in the group (also Todd Helton and Jeff Baker)...selected in first round of draft on June 7, and was officially signed after completing a physical on June 10...worked out at Coors Field on June 11, taking batting practice and infield, including hitting home runs to left off Rockies manager Clint Hurdle...reported to Modesto shortly thereafter and went 0-for-4 as shortstop in his pro debut on June 21 vs. High Desert...recorded eight multi-hit games for the Nuts, hitting .276 (8-for-29) against lefties and .262 (17-for-65) vs. right-handers...recorded first pro hit in 3rd game on June 23 vs. Lancaster, a game-winning RBI single in the 8th inning...hit first home run on July 1 at San Jose, a two-run blast off Giants farmhand Ryan Sadowski...posted a pair of three-hit games, July 19 vs. Stockton and July 23 at Lake Elsinore...in July 19 game, went 3-for-3 with a homer, two doubles, four RBI and two walks while registering career-high three extra base hits...that contest was part of season-high nine-game hit streak from July 4-29 at .390 (16-for-41)...sustained a strained left quad muscle during game on Aug. 2 at Bakersfield and would miss a month on the disabled list...was activated Sept. 3 and went 3-for-9 in two regular season games after his return...hit .348 (8-for-23) with two walks and two RBI during Modesto's five-game playoff run. April 4, 2019 New York Yankees placed SS Troy Tulowitzki on the 10-day injured list. Left calf strain. January 4, 2019 New York Yankees signed free agent SS Troy Tulowitzki. December 11, 2018 Toronto Blue Jays released SS Troy Tulowitzki. November 2, 2018 Toronto Blue Jays activated SS Troy Tulowitzki from the 60-day disabled list. March 29, 2018 Toronto Blue Jays placed SS Troy Tulowitzki on the 60-day disabled list. Bilateral heel bone spurs. November 2, 2017 Toronto Blue Jays activated SS Troy Tulowitzki from the 60-day disabled list. May 26, 2017 Toronto Blue Jays activated SS Troy Tulowitzki from the 10-day disabled list. May 15, 2017 Toronto Blue Jays sent SS Troy Tulowitzki on a rehab assignment to Dunedin Blue Jays. April 23, 2017 Toronto Blue Jays placed SS Troy Tulowitzki on the 10-day disabled list. Strained right hamstring. June 18, 2016 Toronto Blue Jays activated SS Troy Tulowitzki from the 15-day disabled list. June 16, 2016 Toronto Blue Jays sent SS Troy Tulowitzki on a rehab assignment to Dunedin Blue Jays. July 29, 2015 Toronto Blue Jays activated SS Troy Tulowitzki. November 3, 2014 Colorado Rockies activated SS Troy Tulowitzki from the 60-day disabled list. July 22, 2014 Colorado Rockies placed SS Troy Tulowitzki on the 15-day disabled list retroactive to July 20, 2014. Left hip flexor strain. July 11, 2013 Colorado Rockies activated SS Troy Tulowitzki from the 15-day disabled list. July 8, 2013 Colorado Rockies sent SS Troy Tulowitzki on a rehab assignment to Colorado Springs Sky Sox. June 14, 2013 Colorado Rockies placed SS Troy Tulowitzki on the 15-day disabled list. Rib fracture on his right side. October 5, 2012 Colorado Rockies activated SS Troy Tulowitzki from the 15-day disabled list. September 4, 2012 Colorado Springs Sky Sox sent SS Troy Tulowitzki on a rehab assignment to Tulsa Drillers. August 29, 2012 Troy Tulowitzki assigned to Colorado Springs Sky Sox from Tulsa Drillers. August 24, 2012 Troy Tulowitzki assigned to Tulsa Drillers. June 13, 2012 sent SS Troy Tulowitzki on a rehab assignment to Colorado Springs Sky Sox. July 27, 2010 Colorado Rockies activated SS Troy Tulowitzki from the 15-day disabled list. July 23, 2010 Colorado Springs Sky Sox sent SS Troy Tulowitzki on a rehab assignment to Tulsa Drillers. July 21, 2010 Troy Tulowitzki assigned to Colorado Springs Sky Sox. June 18, 2010 Colorado Rockies placed SS Troy Tulowitzki on the 15-day disabled list. Fractured left wrist.